Preconditioning-induced neuroprotection is a well-known phenomenon. Multiple stimuli can induce a preconditioning effect in the central nervous system. Among them are medical gases including volatile anesthetics and hyperbaric oxygen. These gases are routinely used in clinical practice and are relatively safe. Robust neuroprotection has been shown in various brain ischemia models when these gases are used as preconditioning stimuli. Most of these studies were performed in rodents. A few studies used rabbits. The effective time window includes two phases. The acute phase that starts a few minutes after the exposure to the medical gases and can last for a few hours. The delayed phase begins a few hours after the preconditioning stimulation and sustains for a few days. Mechanistic studies have been focused on identifying the intracellular signaling molecules and the effectors. Although neuroprotective effects have been convincingly shown in animals, it is still not known whether preconditioning induced by medical gases can improve neurological outcome after brain or spinal cord ischemia in humans. 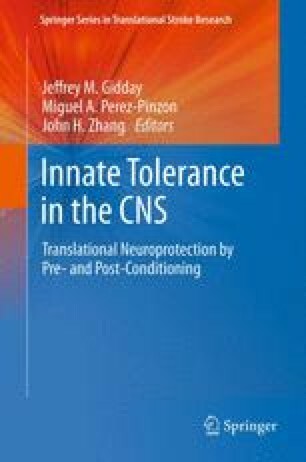 With the accumulation of knowledge on this neuroprotection in animals, it is tempting to think that clinical trials to test the neuroprotective effects induced by preconditioning with medical gases in humans may be performed soon, especially when clinical situations where this type of protection can be applied occur frequently in clinical practice. Such examples include carotid and cardiac surgeries that frequently can induce ischemic events in the central nervous system.